The S&P 500 index has dropped more than 13% this quarter and 5.8% in September, putting the benchmark index on pace for its worst quarterly performance since 2008 as the euro zone debt crisis and weakening economic data fuel concerns economies around the globe are slowing. As of Thursday’s close, the Wilshire 5000 index is down 13.39% for the quarter, representing losses of about $2.2 trillion. China’s factory sector eased for a third consecutive month in September, suggesting that the world’s second-largest economy is not immune to headwinds, while factory inflation quickened. “It’s the end of the quarter. Nothing is really going to save this quarter in terms of anyone’s performance," said Ken Polcari, managing director at ICAP Equities in New York. “The earlier numbers that came out were not so bullish, they were slightly weaker - the mood has been so negative as we came into this last quarter, you might even see a little bit of a flush-out today." 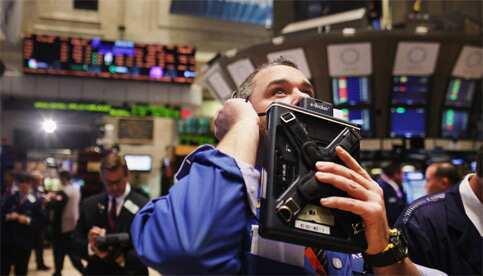 The Dow Jones industrial average dropped 69.40 points, or 0.62%, to 11,084.58. The Standard & Poor’s 500 Index lost 11.56 points, or 1.00%, to 1,148.84. The Nasdaq Composite Index fell 27.37 points, or 1.10%, to 2,453.39. Data from the Commerce Department showed US incomes fell for the first time in nearly two years in August and consumers dug into their savings to keep spending. Ingersoll Rand Plc tumbled 17.3% to $26.42 in after the industrial conglomerate cut its third-quarter and full-year earnings forecast to below market estimates, pointing to lower-than-expected demand. The Morgan Stanley cyclical index dropped 2.1. The Institute for Supply Management-Chicago business barometer surprisingly rose to 60.4 in September from 56.5 in August. Economists had forecast a September reading of 55.5. The Thomson Reuters/University of Michigan’s final September reading of the overall index on consumer sentiment stood at 59.4, up from 57.8 earlier this month. Economists had expected no change from the initial September reading.